Since we moved from southern California late last year, I have been a cat without a cause. I had been an Advo-Cat for the rescue that saved my life and got me the surgery I needed. I have been trying to connect with a new rescue to represent because part of my mission is to pay it forward and help other kitties find loving, forever homes. It has taken a while but we have finally made the connection and now I am an Advo-Cat for A-Pal Humane Society! I am very excited about this. Each Friday, I will share with you one of their kitties. I hope you’ll help me with my mission by sharing these cats. A-Pal Humane Society has a surprisingly long history in Amador County. In 1978 a group of animal loving Amador County residents created the organization with the goal of promoting the humane treatment of animals in Amador County. You can read about their many accomplishments here. 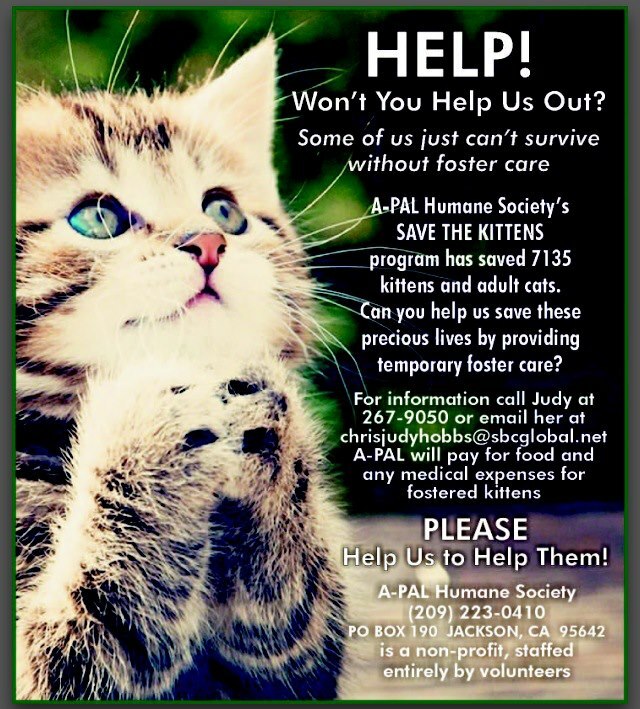 Their bottom line is amazing: A-PAL Humane Society has worked with shelter staff and volunteers to move the shelter intake from 2400 animals annually with a save rate of only 15% in 1988, to 1558 animals in 2013 with a save rate of 87%. Pretty impressive! They have lots of special programs and there are many volunteer opportunities. One thing we think is especially cool is that volunteers actually work at the shelter socializing the animals, walking the dogs, etc. They also have volunteers who foster cats and kittens in their homes. Some of their programs include low cost spay/neuter, community cats and helping animals with special needs. I’m very proud to be able to help this terrific organization meet their goals. Far from wordless today, we are still participating in Wordless Wednesday to share our excitement. We are also joining Be the Change. How can you help animals in need? Tagged A-Pal Humane Society, Advo-Cat, Be the Change, blog hop, blog the change, cat, volunteer. Bookmark the permalink. This shelter sounds fascinating. I hope all works out well. We will definitely share the adoptable animals you tell us about! We feature a special needs and/or senior kitty each week on our blog for adoption on Tuesdays. We feel it’s really important to help other kitties find their loving forever homes because we have been so lucky to have found ours. We can’t wait to help you with your mission! That’s great that you have found a new shelter to volunteer with. I know it takes awhile to connect after moving and being part of another organization for so long! Keep up the great work. Very exciting! Concatulations – let’s hope your work results in lots of forever homes for those who need one! We are both proud and impressed to know you Christy, what a rescue, and what a positive paw-it-forward attitude you have. How awesome! An 87% save rate? That’s really amazing. Here in Michigan we are still fighting to get Detroit Animal Control to check for microchips before they euthanize! You are way ahead of us. Yay for A-Pal Humane Society! That’s such an impressive turn around for a shelter. I’m glad you get to be a part of helping out, and I certainly admire your dedication to helping out animals in need. What a great organization! Thanks for helping. It sounds like a great rescue. We’re glad you finally found a cause to support, Christy. What most excellent news! Mes so furry happy that yous found a cause! Y Dat’s just pawsum Christy. Weez so glad yous found sumpawdy to work wiff. Weez not been very successful in dat awea but we do keep hopin’. Have a pawsum day. Oh, what a good idea. Thanks! Excellent post. Congrats and well done for helping other kitties in need! That is so exciting! Can’t wait to see the kitties.